[ London Hospital, Whitechapel, on eve of First World War. ] Three printed items: pamphlet by Sydney Holland and Eva Luckes opposing 'State Registration of Nurses', leaflet on 'The Nurses' Insurance Society', syllabus of 'Cookery Demonstrations'. [ London Hospital, Whitechapel. ] Pamphlet on 'State Registration of Nurses' undated; leaflet on the Nurses'' Insurance Society headed with date of 1911 act; syllabus undated. The three items are from the papers of Winifred M. S. Parry of Plumstead, who was enrolled as a probationer in 1912. ONE: 'State Registration of Nurses'. Pamphlet in small print, 'Reprinted by kind permission of the Editor of The Nineteenth Century and After'. Printed by 'SCHOOL-PRESS, 5, Rupert Street, London, E.' 24pp., 8vo. Stapled in brown printed wraps naming the authors as 'The Hon. Sydney Holland, Chairman, London Hospital | Miss Eva C. E. Lückes, Matron, London Hospital'. Internally in fair condition, on lightly aged paper, in worn and chipped wraps with rusted staples. [ Eva Luckes, nurse, Matron of the London Hospital. ] Typed Letter Signed ('Eva . C . E. Lückes. | Matron') to Winifred M. S. Parry, regarding her place as 'Probationer' at the Preliminary Training School. On letterhead of the London Hospital, Whitechapel, E. 11 May 1912. 2pp., 4to. Signed 'Faithfully yours | Eva . C . E. Lückes. | Matron.' In fair condition, lightly aged. On two leaves attached with a brass stud. A circular letter, addressed to 'Miss Winifred M. S. Parry, || 69, Vernham Road, | Plumstead, S.E.' Having received the references and agreement form, she informs her that her name 'has been added to our list of accepted Candidates with a view to filling a vacancy which will occur at our Preliminary Training School on June 1st 1912'. Two items bound together. 40pp., 8vo, and  + 31pp., 8vo. Stapled into black printed wraps, with title in white on cover: 'Two Talks to the Nurses of the London Hospital, Dec. 1897, Dec. 1905.' The first talk (1897) is titled: 'A Talk to the Nurses of the London Hospital'. Holland states: 'I am proud, Nurses, of being at the head of what I believe to be one of the best nursed hospitals in England, and it is an added joy to me to be associated in the work with a woman whose life's work it has been to perfect hospital nursing, [i.e. [ Eva Luckes [ Eva Charlotte Ellis Lückes ], Matron of the London Hospital. ] Two numbers of 'Matron's Annual Letter', reviewing the year at the hospital. Both printed 'For Private Circulation Only.' London Hospital, Whitechapel Road, E. No. 19 (April 1912) and No. 20 (April 1913). Uniform in layout. 40pp., 12mo. (No. 19) and 48pp., 12mo (No. 20). Stapled without wraps. Both worn and aged, with rusted staples. Small print. 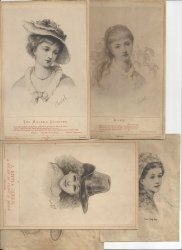 Both addressed to 'My dear Sisters and Nurses', and both signed in type 'Eva C. E. Lückes' and 'E. C. E. L.' Reviews of the two years, packed with information regarding significant events relating to the hospital. Each ending with a two-page 'List of the Names of our present Sisters', followed by 'Names and Addresses of old “Londoners.”', 'Copied from the Supplementary Register' (12pp. in 1912, and 14pp., in 1913). 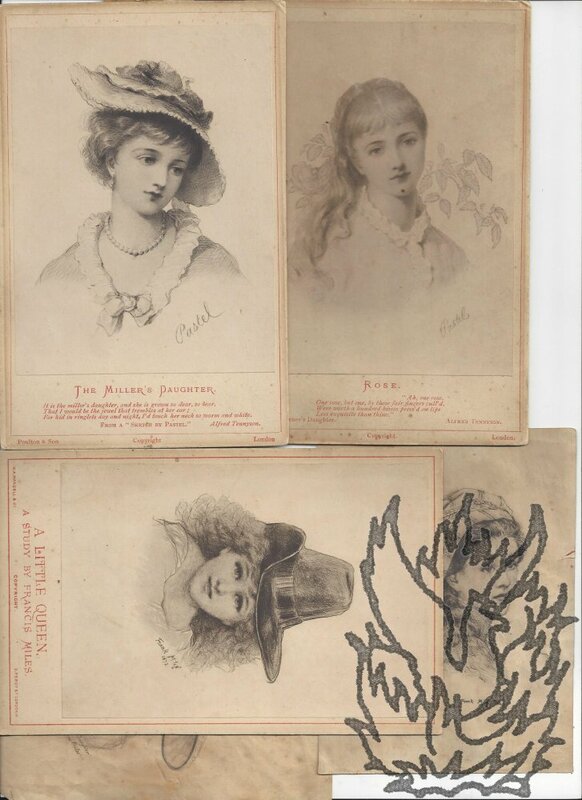 From the papers of Winifred M. S.
[ Frank Miles, artist, friend of Oscar Wilde, and Jack the Ripper suspect. ] Four prints of portraits of young ladies, three of them presented as cabinet cards titled 'The Miller's Daughter', 'Rose' and 'A Little Queen. | A Study by Francis Miles'. Two published by Mansell & Co., Percy Street, London, and dated 1872 and 1873. Two published by Poulton & Co., London. Wilde lived with Miles in the house in Tite Street which Miles had commissioned E. W. Godwin to build for him. Miles ended his days at Brislington House Lunatic Asylum. All four engravings are printed in black. Three (all 'Copyright') are on 13 x 9.5 cm pieces of paper, each laid down on 16.5 x 10.5 cm pieces of card, with printed text in red ink on the card beneath the print; the fourth print is on a loose 12.5 x 9.5 cm piece of paper. On letterhead of St. John's Vicarage, Commercial Street, Whitechapel, E. [ London ] 22 April 1885. 2pp., 12mo. Bifolium. In good condition, lightly aged. Barnett and his wife will be 'up at Oxford on Saturday, May 2nd' and he gives their itinerary: 'We shall be Engaged on the Evening of Saturday: & on Sunday I preach in Balliol Chapel: & attend a meeting in Balliol Hall in the Evening.' If Wells could 'slip a meeting in, at any time, which would leave these times free', Barnett would be 'very glad to come to it'.